Twitter एक micro-blogging tool है .जहाँ पर आप अपने opinion, links, और views 160 characters में share कर सकते हैं . Twitter account का सबसे बड़ा benefit इसका huge user base है और यह Facebook के बाद one of the most popular social networking site है . Twitter पर account बनना बहुत आसान है . 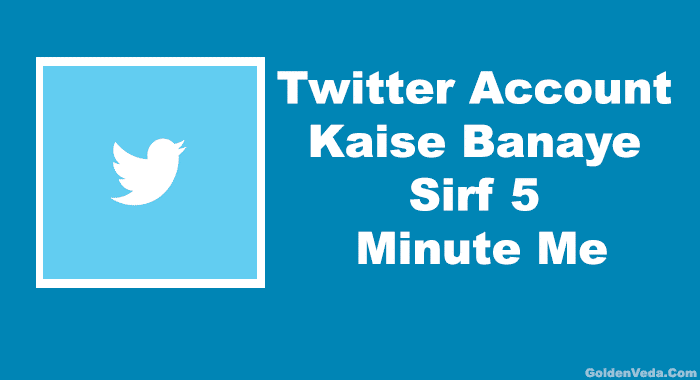 इस post की help से , आप कुछ ही Minute में नया Twitter acccount बनना सिख जाएंगे . 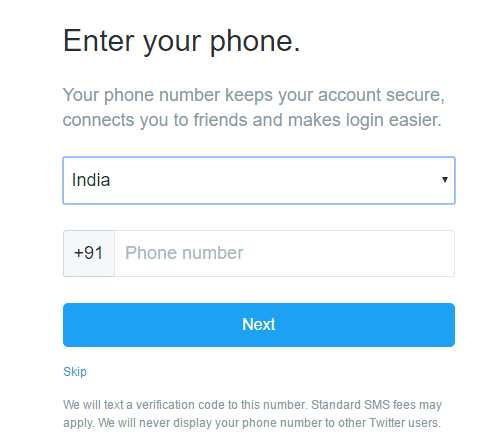 Step 2 – Twitter Account पर अपनी Information add करें . आपको अपना full name, Email Address and password भरना होगा , उसके बाद sign up button पर click कर दे . Full name Box में अपना पूरा नाम लिखें . Email address box में Email डालें . Create a password box में password लिखें . Tips – अपने password में alphabet+numbers+special character include जरूर करें .जिससे आपका password strong होगा and आप hack होने से बच सकते है . Step 3 – अपना mobile number add करे .Mobile number add करने के बाद ,आपके phone पर OTP massage आयेगा .जिसको आप twitter account में add करके verification कर ले . 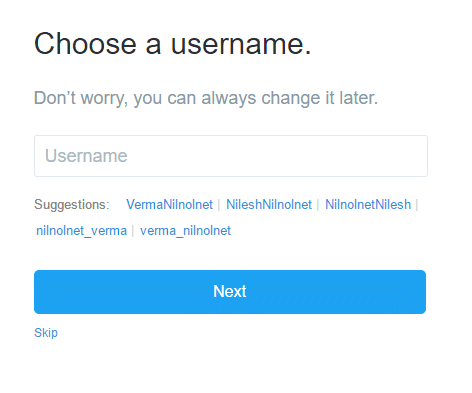 Step 4 – अपना USERNAME choose करे ,जैसा मैंने choose किया है like @iamaakashyadav. Step 5 – Upload your profile picture and अपना personal information add करे , like birth-date,about yourself etc. and कुछ लोगों को Follow button click करके follow भी कर लें . er picture add कर ले ,अगर आपके पास cover picture नहीं है , तो आप randomly कोई भी picture choose कर ले . About me में जाकर अपनी other information like birthday,about yourself and other importent details add कर ले . दिए गए box में आप अपनी feeling and thoughts share कर सकते है . Step 6 – आपके Email account में भी एक verification link आया होगा , उसको click करके भी आप अपने twitter account activate कर सकते है . Step 7 – Congratulation ! आपका Twitter account ready है .अब आप अपने thoughts and feeling friends के साथ share कर सकते है . and अपने favorite celebrity को follow भी कर सकते है . I hope की मेरी यह Quick guide Twitter account बनाने में आपकी help करेगी .And आप भी एक new social media platform में जुड़ सकेंगे .So friend आपको कोई doubt हो तो comment करे and please share करना न भूलें . आप हमे Social Media पर Follow भी कर सकते है.